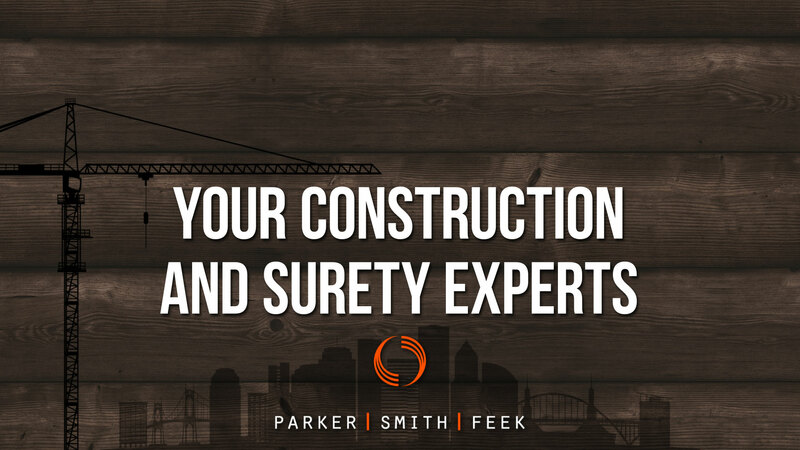 Surety is an important part of Parker, Smith & Feek’s service offerings, and our world class capabilities have helped make us a leader in this field. This department is staffed by team members with significant surety company experience in both underwriting and management. This intimate familiarity with the operations of various sureties makes us particularly well suited to act as counselors and advocates for our clients. We provide contract and commercial bond services to more than 200 clients through powers of attorney with 20 underwriting companies. In recent years, we have arranged more than $2 billion in bonded construction. We understand the importance of timely and accurate bond issuance, especially bid bonds. Utilizing technology and reliable transportation partners, we have met the shortest deadlines posed to us, which have at times been merely hours. Our bond review services ensure that contractors’ rights and obligations are protected, as well as confirming subcontractors’ payment and performance obligations are guaranteed. We have established protocols in place that will not permit a bond to be issued until it has been double-checked by our extremely accomplished and experienced administrator staff. Our longstanding relationships with bond underwriters and major sureties enable us to give our clients every advantage in negotiations on their behalf, and our market position helps them pre-qualify potential sub and prime contractors. As our clients’ trusted surety broker, our number one priority is the success of their business.